Stain Off-Fabric Prewash - Goodmaid Chemicals Corporation Sdn. Bhd. SUPERCLEAN Formulation to effectively penetrates, dissolves and lifts away grease and stubborn stains in clothes. 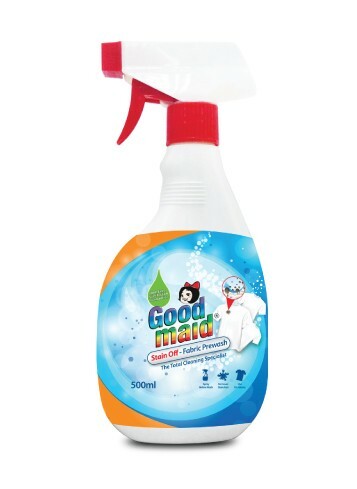 • Combination of Biodegradable Surfactant, Enzymes and Solvent to remove stains without pre-soaking and scrubbing. • Suitable to remove stubborn stains such as grease, grime, blood, lipstick and dirt. • Spray directly onto soiled areas while the clothes are dry. Ensure soiled areas are completely saturated with Stain-off. • Leave for one minute and wash with other clothes as usual. • For stubborn stains, leave for 30 minutes then wash thoroughly. With SUPERSOFT Formulation that provides exceptional softness for silky smooth clothes. Refreshing and pleasant smell for all kinds of fabric.